So says Rob Kirby (www.kirbyanalytics.com) in edited excerpts from his original article*. Lorimer Wilson, editor of www.munKNEE.com (Your Key to Making Money!) has edited ([ ]), abridged (…) and reformatted (some sub-titles and bold/italics emphases) the article below for the sake of clarity and brevity to ensure a fast and easy read. The article’s views and conclusions are unaltered and no personal comments have been included to maintain the integrity of the original article. Please note that this paragraph must be included in any article re-posting to avoid copyright infringement. The original intended use of derivatives was to manage risk (hedge); however, now they are often traded as investments whether hedged, un-hedged or as component of a spread trading strategy. The diverse range of potential underlying assets and pay-off alternatives leads to a wide range of derivatives contracts available to be traded in the market. indices such as a stock market index, consumer price index (CPI) — see inflation derivatives — or even an index of weather conditions, or other derivatives). The largest component of the derivatives complex remains interest rate products which the U.S. Office of the Comptroller of the Currency tells us constitute more than 82 % of all outstanding bank held notionals. Interest rate derivatives have a great effect on interest rates as will be discussed later. Derivatives have their roots in the agri-complex. From an historical context, it was agricultural commodities futures (mainly grain) that first gained traction as viable financial instruments. The genesis of these products dates back to the founding of the Chicago Board of Trade (CBT) in the mid-eighteen hundreds. Back in the eighteen hundreds large scale farming enterprises were difficult (risky) to “bank”. The risk was embodied by the known costs associated with planting seed, fertilizing and subsequent growth and harvest – versus the often volatile, unpredictable final selling price of a perishable commodity. Futures removed…this “unknown” from the banking/farming relationship and transferred it to speculators for a nominal fee or cost. From 1850 – 59, American agricultural exports were $189 million/year (81% of total exports). With agriculture occupying such a huge percentage of exports and GDP it was only natural that business of this scale (potential fees and profits) would and did attract the attention of the money changers. The advent of futures and forward contracts in the agri-complex was productive: giving a higher degree of predictability to farm income making the business of farming more bankable. Making farm income more predictable enabled the growth of corporate agri-businesses which brought with it economies of scale, the freeing-up of human capital which enabled / translated into mass migration [urbanization] of farmers into cities in part assisting with the rise of the human capital pool essential for the industrialization of America. In the beginning, as with users in the agri-complex – there were identifiable end users (farmers) for these products. Over time, futures and forwards were developed to meet demand in other…commodities like coal, crude oil, lumber, cattle and others. Similar commodity futures markets for these products and trade volumes were driven primarily by end users and it’s important to distinguish that for the entire 1800s and virtually all of the 1900s – the growth in derivatives was primarily tied to the commodity trade. Price Discovery is a method of determining the price for a specific commodity or security through basic supply and demand factors related to the market. to assure an effective vehicle for risk transference. Implicit throughout [the above purposes] is the need to provide suitable customer protection from abusive trade practices and fraud. President Nixon took America and the world off the gold standard in August, 1971. What ensued was a dramatic increase in the price of crude oil which led to burgeoning balances of petro dollars (Euro-dollars) as deposits in the treasuries of banks involved in international trade and a subsequent bolstering of their treasury operations to deal with the influx of ‘inflated dollars’. Interest Rate Derivatives were developed around 1980. Their basis was the four 3-month IMM (International Money Market) Eurodollar Futures Contracts (December, March, June, September) on the Chicago Mercantile Exchange (CME). These futures contracts are derivatives of 3 month Libor (London Interbank Offered Rate) for Eurodollar Time Deposits. The 3 month Libor rate is ‘set’ daily by a group of banks selected by the British Bankers Association and represents where these ‘reference banks’ are willing to ‘loan’ their mostly recycled Euro Dollars (petro-dollar) to their most credit-worthy customers. These derivatives/futures gave banks the ability to ‘hedge’ or book profits on sizable amounts of predictable future cash flows. Up until 1980, this bank treasury trading business remained largely a cash trade. In 1980, Canada revised its Bank Act. In the ensuing few months Canada went from having 5 domestic banks to having roughly 65 foreign banks – dubbed “schedule B” banks. To protect their home turf, the existing domestic banking industry successfully lobbied Canadian politicos to limit the amount of capital [these] new “schedule B” banks could have to initially 5 million, and in a couple of instances,10 million Canadian dollars. This placed growth restrictions on the new foreign bank entrants [as these] capital ceilings implied severe balance sheet restrictions [as they] were substantially limited in participating in main stream bank treasury operations, such as lending long and borrowing short in the inter-bank market, because these activities bloated balance sheets. [As such, they]…needed to find a profitable raison d’etre or their parent banks would shut them down. it circumvented capital ceiling restrictions. From a customer standpoint these products were marketed to corporate customers as a means to achieve cheaper, more flexible funding or alternatives for funding in terms (years) they otherwise would not be able to access…. Citibank-Toronto was the first to engineer a financial model to successfully book accounting profits from FRAs and interest rate swaps and in the beginning these trades were enormously profitable, so much so that Citibank-Toronto very quickly became the world’s biggest OTC interest rate derivatives house and was, in fact, the clearing house for OTC interest rate derivatives for Citibank worldwide. This business absolutely mushroomed [as can be seen in the graph below]! 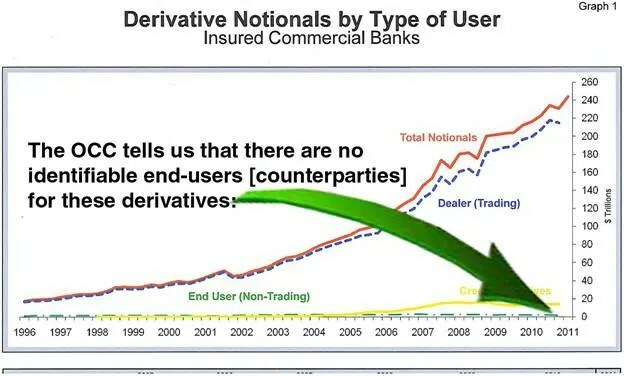 Tracking the evolution of the aggregate derivatives held by U.S. banks, it is apparent that trade in end-user products has been absolutely overwhelmed by volumes in dealer trades – all in a “supposed market” which [as of June 30, 2011] is 96% constituted by 5 players (J.P. Morgan [23.5%], BofA [22.5%], Citi [16.5%], Goldman [16.5%] and Morgan Stanley [17%]) – as the U.S. Comptroller of the Currency tells us in the executive summary of their Quarterly Derivatives Report. At this rate of concentration, the derivatives complex appears a lot more like an “old boys club” than it does “a market”. Therefore, the derivative market rapidly evolved during the late 1990’s to the early 2000’s from a previously end-user-based to a dominantly dealer-based or trading market. The parabolic rise of these dealer traded volumes parallels the rise of market rigging or the movement toward a centrally planned economy. Through the late 1980’s and early 1990’s the Fed and U.S. Treasury – with a little bit of help from academia – realized that interest rate swaps could be utilized to CONTROL fixed income (bond) markets and hence – controllers could arbitrarily determine the cost of capital. As such, it’s no coincidence that institutions like Citibank-Toronto had their ‘U.S. Dollar derivatives books’ repatriated back to New York in this time frame. Historically, the Federal Reserve/U.S. Treasury only had control of the very short end of the interest rate curve – specifically the Fed Funds rate (the rate at which banks and investment dealers borrow and lend to each other on an overnight basis). With the advent and proliferation of interest rate derivatives, [however, and] specifically Interest Rate Swaps, the Fed/Treasury gained effective control of the “long end” of the interest rate curve. Thus the Fed/Treasury has been practicing an undeclared form of financial repression for a very long time. In free market economies the laws of usury dictate that the interest rate mechanism serves as the arbiter as to where scarce (finite) capital is allocated. Historically, it was a group of industry professionals known as the bond vigilantes who enforced this discipline – primarily on spend-thrift governments – by making them pay more, through elevated interest rates when they demonstrated poor stewardship of national finances. Before the neutering of ursury, [what I now refer to as “neusury”,] when the bond vigilantes “sold” interest rates went up. To illustrate this point look no further than Bill Gross (the closest thing there is to a bond vigilante today) who heads the world’s largest bond fund PIMCO, who dumped all the US Treasury bond exposure in its flagship Total Return Fund given his belief at the time that Treasurys were over-valued. The incapacitation or extinction of the bond vigilantes has enabled the U.S. government to spend like drunken sailors, prosecute wars and misallocate resources on a grand scale – all the while lowering and/or keeping interest rates at or near zero percent. This arbitrary, gross mispricing of capital helped to spawn further abuses like the real estate and equity bubbles – the development of which produced new sub-sets of equity derivatives and cdo’s which also enabled the macro-management of these markets. Economics 101 tells us that capital is scarce and finite but, by arbitrarily rigging interest rates too low, capital markets created the false impression of abundance and loose lending practices resulted. Control over the long end of the interest rate curve works as follows: The U.S. Treasury’s Exchange Stabilization Fund (ESF), a secretive arm of the U.S. Treasury unaccountable to Congress, began entering the “free market” – deals brokered by the N.Y. Fed – as a receiver of “all in” fixed rates – in terms from 3 to 10 years in duration. Interest rate swaps trade at a spread – expressed in basis points – over the yield of the 3, 5, 7 and 10 year government bond yield. Banks are virtually all spread players. When trades occur between spread players – one side of the trade sells the other side of the trade the proscribed amount of U.S. Government bonds. This creates superfluous settlement demand for bonds. When the U.S. Treasury’s Exchange Stabilization Fund intervenes in this market,[however,] they are not spread players. When the ESF trades with “spread players” (Morgan, Citi, BofA, Goldman, Morgan Stanley) the banks are forced to purchase cash – physical U.S. Government bonds in the proscribed terms (3-10 years) – almost dollar-for-notional-dollar as hedges for each trade they do with the ESF because the ESF does not supply them. This is why, instead of the hollow, contrived, official excuses offered by the Fed [and] despite record, off-the-charts, government bond issuance, a remarkably large percentage of U.S. Government bond trades fail to settle. The ESF participates in these trades taking “naked interest rate risk” – meaning they do not provide their counterparties with the requisite amount of bonds to hedge their trades – thus forcing them into the “free market” to purchase them. This generates unbelievable “stealth” settlement demand for U.S. Government securities. This is how/why U.S. Government bonds and hence the Dollar can be made to appear “bid-unlimited” – even when economic fundamentals are screaming otherwise. is the real reason why J.P. Morgan Chase and the rest of the magnificent 5 now sport OTC derivatives books of 50 – 80 TRILLION in notional. [For those so interested]…the detailed, documented, inner workings of the Treasury’s Exchange Stabilization Fund and their unique relationship with the N.Y. Fed trading desk is best explained by forensic financial researcher Eric deCarbonnel, here. Rather than let the “fiat” U.S. Dollar fail, as all irredeemable fiat currencies are designed to do. [those] in charge of the Anglo/American banking edifice have bought time through the capture of the derivatives price control grid by blatantly commandeering the unlimited resources of the U.S. Treasury’s ESF along with the printing presses of the Federal Reserve. This is done to make historic alternative currencies, like precious metal, appear unworthy. This has further endangered the financial wellbeing of all who have acted prudently and financially responsible. As the interest rate swap mechanism is used to corral interest rates – so are gold futures contracts on exchanges like COMEX and the London Bullion Market Association [LBMA] used to suppress the price of the U.S. Dollar’s number one competing currency alternative – gold. The reality is that metals exchanges, like those identified above, have sold as much as 100 times, or in some case much more, paper ounces or promises of gold in the form of receipts than they have physical bullion available for delivery in their vaults. There is plenty of documented proof available…that conduits for procurement of physical precious metal like national mints have been choked or suspended for prolonged periods of time over the past few years for investment grade physical gold and silver bullion coins. These shortages have always been characterized by, or in, the…financial press as being the result of issues specific to the retail trade (like not enough gold or silver “blanks” available from which bullion coins are stamped). These reported bottlenecks, however, fly in the face of anecdotal reports by the likes of major industry players such as Sprott Asset Management principal, Eric Sprott, who has reported that institutional amounts of silver bullion received were virtually all smelted after they were bought and paid for which is inconsistent with the waterfall declines [sewering] of paper-silver-prices on highly conflicted and suspect exchanges like COMEX and also inconsistent with the notion that physical silver bullion shortages are strictly a retail phenomenon. The derivatives that trade on exchanges, supposed[ly] to reflect or aide in price discovery, are increasingly being used as tools of price manipulation. All is not well in America – not by a long shot. America has been taken over through subterfuge in a financial, fascist coup and the perpetrators have installed a police state. America is no longer a nation of laws. Any additional regulation of the financial services industry would be fruitless. There already exists “laws on the books” – to prevent the blatant, criminal price rigging / abuse that has already occurred. The abuse has been allowed to occur by derelict regulators who have vacated (or been bought) their fiduciary duties. It’s all about control. Derivatives products – well intentioned when they were conceived – have been utilized to prop-up a failing fiat currency and undermine capital through the establishment of a phony, crony, price control grid. As such, derivatives have become very dangerous tools in the hands of a gaggle of miscreant sociopaths (who think, speak and act as if they are doing god’s work) that now occupy the U.S. Treasury/Fed and rule Wall Street. Previous Celebrate “Dow 20,000″ Because We’ll See “Dow 10,000″ Again Before We See “Dow 30,000″!